Brown bear (Grizzly bear, Ursus arctos) close and personal. Katmai National Park and Preserve, Alaska. 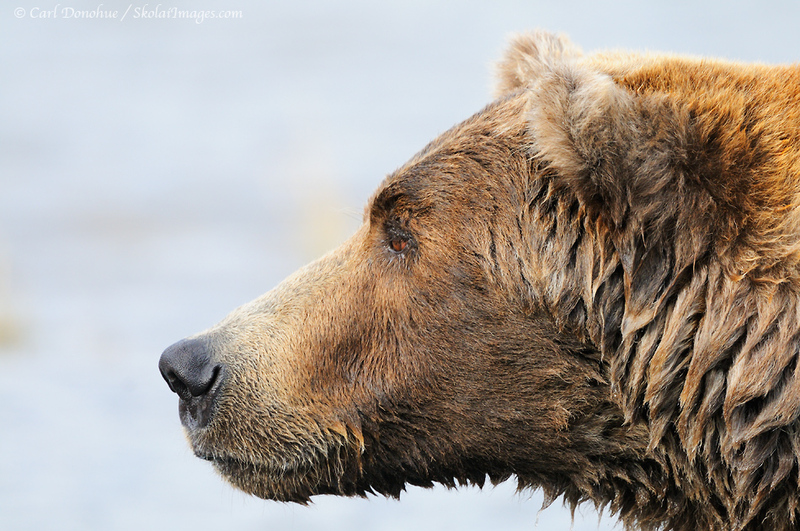 A headshot of a massive dominant male brown bear, from the Brown Bears in the Fall photo tour, 2010. This is really cool, Carl! I haven’t often seen profile shots of bears, and I really like how intense his stare is. You can tell he’s focused on something! I agree with Pat. I like this unusual framing of a Brown Bear. The brown bear can reach a maximum weight of 440kg(the male); he is heavier during autumn, before entering the lair, while during spring, right before the vegetation starts to appear, he reaches his lowest. The hair color varies on a large scale, from brown-grey to dark-brown, while sometimes it can be almost black; some of the brown bears, especially the younger ones have white spots on the neck, called collar or bead, which in reality isn’t an enclosed circle. For some of them the collar disappears in time while for others it stays the same. Their most frequent color of a brown bear is, of course, brown. During winter the fur reaches a size of 8-9 cm, while in the summer period it varies between 4 and 6. The fur is most valuable in the months of March and April, while during autumn it becomes less valuable because of it’s reduced size and low density. This specie sheds in the months of June and July. Out in the field, you can’t tell the male apart from the female. The maximum age they can get to is of 30-35 years. Posted on Thursday, June 16th, 2011. This epic photo was taken by Carl Donohue.